The official franchise of the Telebrands PAKISTAN has got the complete range of different types of treadmills, elliptical machines, magnetic bikes and air bikes under one roof. Today, the company has come up with a new and revolutionary product that will definitely meet up your high expectation of the customers. 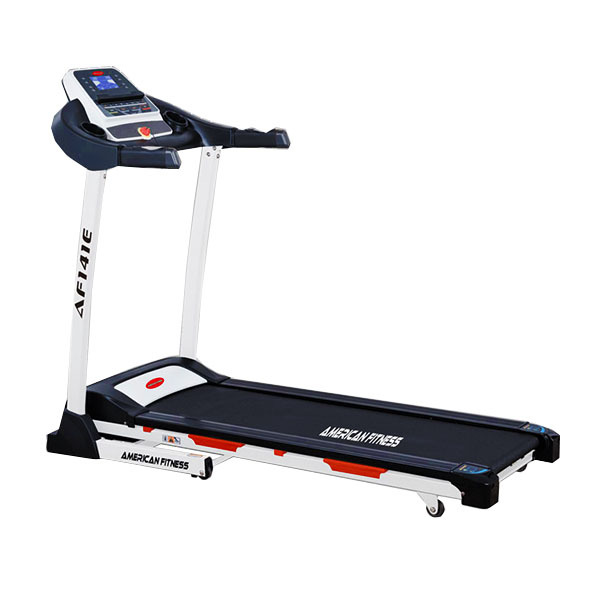 The name of this quality product is the American Fitness Running Machine AF-141E. The American Fitness Running Machine AF-141E, as the name clearly indicates, is a premium quality treadmill machine designed to use for commercial, semi-commercial and domestic purposes. The American Fitness Running Machine AF-141E is equipped with the reasonable 2 Horsepower motor that can easily withstand the maximum user weight up to 100 KG in total. The American Fitness Running Machine AF-141E has a maximum speed up to 14 Km/Hr and it has a total running surface area of 1300 x 410 mm. The treadmill machine is equipped with the dedicated LCD display that shows different real time readings related to exercise as the Time, Speed, Distance and so on. The American Fitness Running Machine AF-141E features the 24 pre-set program levels and 12% inclination level, so that all the users can easily set the resistance of the machine as per their convenience. Now you do not need to purchase another heavy-duty treadmill machine for your purpose, as the very same machine will definitely help to fulfill your purpose in the best manner.